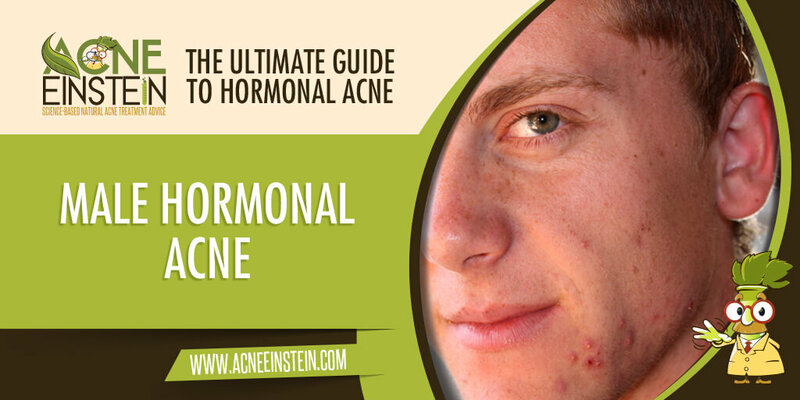 Hormonal acne in men can be different than in women and is usually not seen as a problem of too high androgen levels. Most of the research on the link between hormones and acne has been focused on women, and we know much less about the hormones that cause acne in men. Testosterone and other androgens cause acne also in men, as high rates of acne among those who abuse anabolic steroids shows, but acne in men is not usually seen as a sign of abnormally high androgen levels. Evidence to date points to the role of insulin and insulin resistance as the main causes of hormonal acne in men. The table below compares blood sugar and insulin levels between those with and without acne is from a study that only included men. We already covered this on the page about insulin, but, briefly, those with acne had four times higher post-meal and two times higher resting (fasting) insulin levels than those without acne. See the page about insulin on how this can lead to acne. Insulin, and the knock on effects it has on acne, explains why taking whey protein is known to cause acne, and why diets that reduce sugar and processed carbohydrates reduce acne in both men and women. It’s also possible that other hormones affect acne in men, but that’s a question for future research to answer.